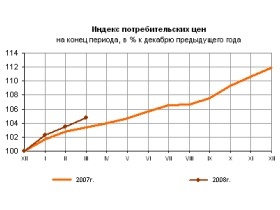 April 9th, 2008: In a sign that Russia’s economy may be overheating, inflation in the country climbed to 5.3 percent since the start of the year. According to the latest figures from Russia’s Federal Statistical Service (Rosstat), prices grew by .5 percent in the first week of April alone. The inflation rate is significantly higher than previous years. The first quarter of 2008 saw a 4.8 percent rise in inflation, as compared with a 3.4 percent rise in the first quarter of 2007. Rosstat’s figures also seem to indicate that inflation is accelerating. Weekly inflation in March rose from .2 percent at the start of the month to .3 percent in the last week. The highest price growth was noted in bread, baked goods and wheat flour. Prime Minister Viktor Zubkov was furious with the Finance Ministry: “Over the past several years the government managed to meet the forecast inflation target only once,” Itar-Tass quoted. “That was in 2003. In all of the subsequent years inflation proved higher. Last year alone the forecast level was exceeded by a hefty 4 percentage points,” the prime minister said. The official prognosis for the year was initially 8.5 percent, and was raised to 9.5 percent in March. Many economists discount this estimate as conservative, and believe the real rate could come to 15 percent or more. In 2007, the rate reached 11.9 percent, 3.9 points over the 8 percent estimate. A recent poll conducted by VCIOM, the state-owned public opinion organization, found that nearly three fourths of Russian residents believe inflation to be very high. 18 percent believe inflation is moderate, and 2 percent, insignificant.